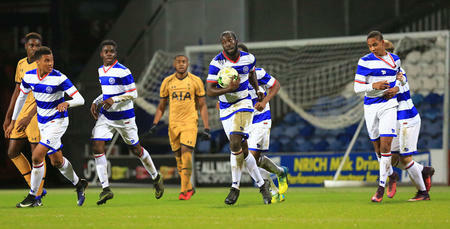 QPR Ladies fell to a second successive four-goal defeat on Wednesday evening when they faced Tottenham Hotspur at Honeycroft. Goals from Nikita Whinnett (2), Kelley Blanchflower and Josie Green gave the North London side all three points and leave Rangers awaiting their first of the season. 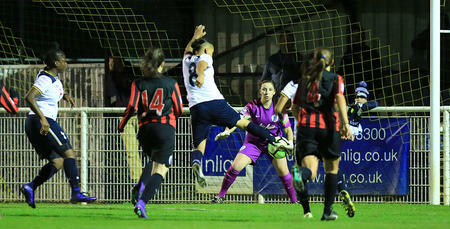 Sophie Cheadle returned in goal for QPR and was kept busy all night producing a series of saves to keep the score at four. The goalkeeper, who left to join FA Women’s Super League 2 side Watford in January, was returning to cover in goal after injury to first-choice stopper Victoria Caldwell on Sunday. The visitors started the game at a fast pace, forcing a string of saves from Cheadle in the first half - most notably from lively striker Whinnett. It seemed like it might not be Spurs’ day in the first half after efforts went wide, over, were saved and twice prevented by the crossbar. And even when the ball did find the net on 22 minutes, it was controversially ruled out for offside. But the deadlock was finally broken in first half stoppage time. A low long-range effort was diverted past Cheadle by Whinnett to give the visitors a 1-0 lead at the interval. And the North London side started the second half as they finished the first, again hitting the crossbar for the third time with a long-range effort. It took Tottenham 10 minutes to find the back of Cheadle’s net after the break when Whinnett pounced on a rebound to knock into an empty net from a few yards out. The lead was then extended to three when a cross was headed down by Alex Keown to Blanchflower who, despite strong offside claims for the Rangers defence, made no mistake. The visitors kept looking for more goals and the best was yet to come. Green unleashed a shot from 30 yards that looped over Cheadle and found the top corner with six minutes remaining on the clock. And that wasn’t to be the last action of the game. Spurs found the net again in stoppage time but this time the strike was ruled out by the linesman’s flag. The third defeat of the season sends Rangers to the foot of the FAWPL South table while Tottenham move to the summit with three victories out of three. QPR: Cheadle, Lopes, Engels, Harte, Peacock, Searle (Thompson 77), Buzaglo (Smith 55), Critchley, Godden, Peck, Anu (O’Callaghan 67).